Exporter of a wide range of products which include tubular heating elements and commercial heating elements. 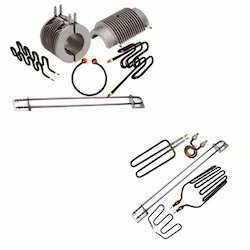 Tubular Heating Elements designs and manufactures industrial electric tubular heaters that set the industry standard for excellence. The most versatile of all electric heating elements, the tubular heaters are capable of being formed into virtually any configuration. Depending on the application different tube diameters and different tube Sheath materials are available. Heating of air requires an oxidized tube surface. The Commonly specified Sheath Materials are SS304, SS316, and SS316L & INCOLOY for high temperature applications. The range of ratings, sizes, materials and terminations available, makes the tubular heater adaptable to many industrial, commercial and scientific applications. All watt ages and voltages are possible as long as the resistance is within the fixed limits and the surface load will not be exceeded. Our Commercial Heating Elements converts electricity into heat through the process of Joule heating. Electrical current running through the element encounters resistance, resulting in heating of the element. We use high quality nichrome wire or ribbon as the conductor because nichrome is an ideal material, as it is inexpensive, has relatively high resistance, and does not break down or oxidize in air in its useful temperature range. 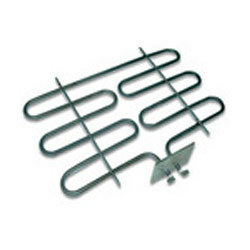 We offer these commercial heating elements at market leading rate. Looking for Industrial Heating Elements ?